Corrie's death came amid a bloody 24 hours in the Gaza Strip. Ten Palestinians, including a 4-year-old girl, were killed yesterday as more fighting erupted. At least 1,942 Palestinians and 726 Israelis have been killed since the start of a Palestinian uprising for statehood began in September 2000. 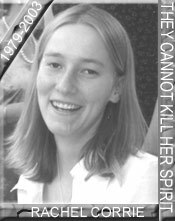 Corrie, 23, a student at The Evergreen State College near Olympia, had been active in organizing events in Olympia's peace movement. Through a local group called Olympians for Peace in the Middle East, she joined the International Solidarity Movement, a Palestinian-led group that uses nonviolent methods to challenge Israeli occupation. As an ISM volunteer, Corrie was living in the southern Gaza city of Rafah. In recent weeks, she and other members of the ISM said they had protected a water well and challenged the demolition of Palestinian homes, which the Israeli military argues is necessary as a counterterrorism measure. The ISM has disputed that, saying Corrie was in the driver's line of sight, was wearing a fluoresc Corrie died at a local hospital from massive internal injuries. ent jacket and had been yelling into a bullhorn. Corrie, a longtime political activist who would have graduated from Evergreen this year, was mourned for a second day on the college's campus in Olympia, where students set up an shrine in the library. "She loved life. She wasn't trying to be a martyr," said Peter Bohmer, an Evergreen economics teacher who had known Corrie since she was 10 years old. "I don't think she was na�ve. I think she was courageous." "We are now in a period of grieving and still finding out the details behind the death of Rachel in the Gaza Strip. We have raised all our children to appreciate the beauty of the global community and family and are proud that Rachel was able to live her convictions. Rachel was filled with love and a sense of duty to her fellow man, wherever they lived. And, she gave her life trying to protect those that are unable to protect themselves." Corrie would have graduated from Evergreen this year, was mourned for a second day on the college's campus in Olympia, where students set up an shrine in the library. Palestinian leader Yasser Arafat said today he contacted Corrie's family and expressed his condolences. "Our people embrace her and offer her our blessings," he said. At U.N. headquarters in Gaza City, about 200 Palestinians and foreigners attended a memorial service for Corrie on Monday. Four girls placed a picture of Corrie and flowers on an empty coffin, and mourners observed a moment of silence. Many memorial services were held for around the world for Rachel. In Palestine memorial services were held in several cities including Rafah, Ramallah, Bethlehem, and Gaza. The Palestinian have wrapped Mock Coffins for Rachel in the Palestinian and the American flag. In Rafah, a 43-year-old Palestinian civilian killed by army fire Sunday, just after Corrie was crushed, was buried Monday. Mourners also carried an empty casket wrapped in U.S. and Palestinian flags, in memory of the peace activist. Smith, who witnessed Sunday's incident, said it began when Corrie sat down in front of the bulldozer. He said the driver scooped her up with a pile of earth, dumped her on the ground and ran over her twice. Smith said Corrie was dressed in a bright orange jacket with reflective stripes. Joe Smith, 21, from Missouri, who witnessed Sunday's incident, said it began when Corrie sat down in front of the bulldozer. He said the driver scooped her up with a pile of earth, dumped her on the ground and ran over her twice. Smith said Corrie was dressed in a bright orange jacket with reflective stripes. Protesters have stopped bulldozers in the past by sitting down in front of them, Smith said. Corrie did this Sunday, but this time the driver did not stop, Smith said. Corrie wore a headscarf when working among the Palestinians, especially in Rafah where people tend to be more observant, Smith said. The International Solidarity Movement has actively protested Israel's operations during the 29 months of violence. Last March, members of the group holed up in Bethlehem's Church of the Nativity during a military siege and sneaked into Arafat's compound when the army blockaded his Ramallah headquarters. They killed Rachel because they do not want witnesses. They did not want them in Sabra and Shatilla and they did not want them in Jenin Camp. They want us to bleed pain to death without hospitals, ambulances, without doctors, without witnesses.